Dealer’s choice: Brendan Macdonald on Ontroerend Goed’s interactive game about the world of banking. £¥€$ (LIES) at Summerhall, as part of the Edinburgh Fringe 2017. When you walk into Lies you see a number of blackjack tables set around the room. Audience members sit at a table which symbolise individual nations, each named after the first audience member who sits down. A rotating board in the centre of the room details the world’s profit-making and economic status. Each table has a dealer who is part of the cast; they lay down the rules of the game in unison, and advise your nation on investment strategy and growth. Because in Lies you are the banks, and you make the decisions. 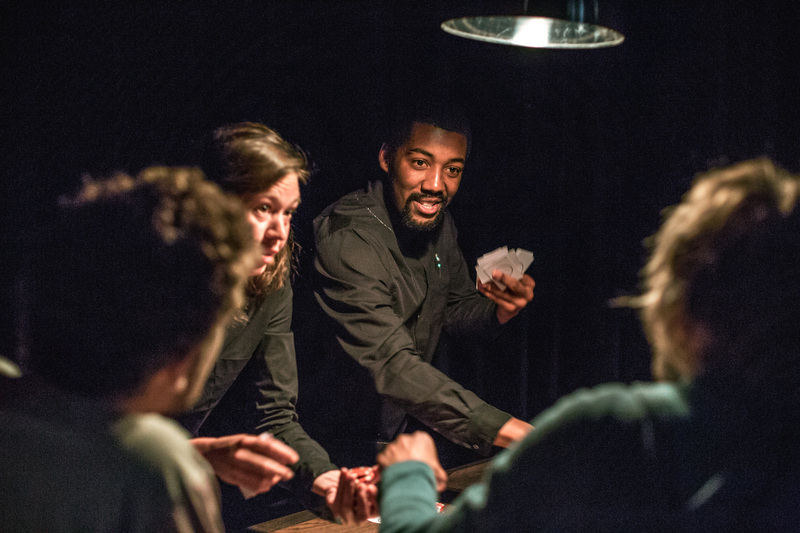 Ontroerend Goed’s award-winning 2017 Fringe hit is an exacting and shrewd immersive performance. Part of its brilliance is its simplicity, functioning as a simple game of odds where winning means more money. From someone who knows next to nothing about economics, it allows for quick immersion into the world and ease of play from the beginning. The markets open, you roll the dice, the markets close, you count your earnings. Government bonds are introduced, GDPs increase, and the stakes rise. Once acclimatized to the logic of the game and eased into its potential perils, slowly but mechanically audiences are encouraged to merge, to borrow, and to take higher risks for the sake of growth. Set to a brilliantly cresting yet peripheral score by Johannes Genard that crescendoes with intensity, Lies defty scripts in its audience feelings of greed, desire, and the thrill of the bet. For a show about deceit, it’s shockingly transparent. The casino-like atmosphere evokes an immediate sense of distrust, fascination, and excitement. It makes clear that the game is rigged and that it favours the dealer. But even with a looming awareness that a crash is inevitable and that these mechanisms are unsustainable, the impulses to compete, to survive, and to grow become the primary drivers of action. And it’s unsettling how fun it is. The two-hour long game/show/economic cycle goes by swiftly. More variables and complexity in the game would intensify the experience, and if anything, the inevitable fall comes slightly too early. But like many forms of gambling, Lies whets the appetite with the desire to play more, to make more, to risk more. And that’s why it’s so good. It doesn’t make any spectacularly revolutionary insights into capitalism or how it operates, nor does it give a grand theatrical narrative on the subject. Instead, it simply describes how the global economic landscape functions using tools and scenarios familiar to us. Most importantly, it outlines the allure and insatiability of economic marks. Lies simultaneously foregrounds the unsustainable and deceitful reality of our financial models while also demonstrating how easy it is to be swept up in it all. Lies was on at Almeida Theatre until 18th August.